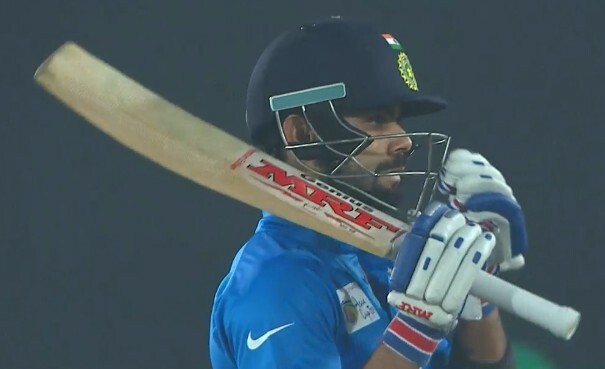 The Indian captain Virat Kohli is always deemed to be the one who can break the mammoth batting records set by the legendary Sachin Tendulkar. If there’s anyone who seems like getting anywhere close to the records of the Master Blaster, it’s Virat Kohli. Despite having accounted for tremendous numbers midway through his career, he has a huge mountain to climb to reach near Tendulkar. But there’s one record Virat is certainly going to break in the near future. The 29-year-old needs 187 runs more to go past Tendulkar in terms of the most number of runs by an Indian batsman against Windies in ODI cricket. Sachin Tendulkar is currently India’s highest run-getter against Windies in the 50-over format against the Indians. He has 1573 runs to his name from 39 games at an average of 52.73 with 4 centuries and 11 half-centuries. Virat has so far scored 1387 runs from 27 matches, averaging 60.3 with 4 hundreds and 9 fifties. The ODI series between India and Windies starts on October 21 and will consist of 5 matches. Going by the form Virat is in presently, one would expect him to score the needed 187 runs to go past Sachin. After Virat, Rahul Dravid stands on the 3rd slot with 1348 runs from 40 ODIs at an average of 42.12 with 3 centuries and 8 fifties. The former captains Sourav Ganguly and Mohammad Azharuddin also feature in the top 5 run-getters for India against Windies in ODI cricket.